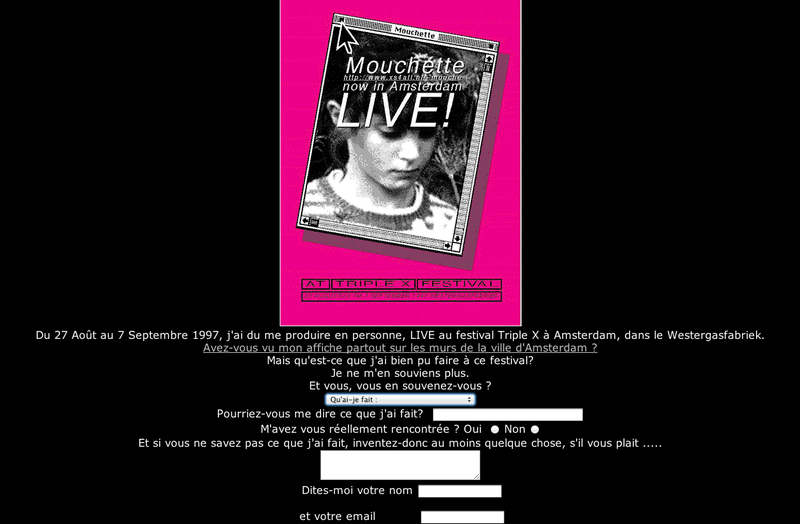 Me, Mouchette, the online virtual character, I have an unusual status of existence. Regarding the art of my website (www.mouchette.org) I am the author and the creation at the same time, and yet through my remote internet life I remain invisible, anonymous, genderless, untouchable, neither alive or dead. Therefore participants of my interactive website confide in me in the most intimate way, as if were an imaginary being, living in their own head. Inside their own thoughts, no subject is taboo, fear, pain, life and death or even the temptation of suicide, and with me people feel free to talk about everything. With the reactions of the participants to my website I have composed animation films displaying many of the texts I received, spoken out by pixellated characters who tell their most private thoughts about their experience of surviving suicide, their own or someone else’s. My personality embraces all of my participant’s minds and together we form a collective consciousness pondering over questions of life and death in the digital era. And like in the famous Hamlet monologue, to be or not to be Mouchette, that is the question! The work has been exhibited first within the manifestation Knotenpuntke in Germany and was shown on screens in the museum of Siegen Germany in 2007. Requires a browser with Flash plugin.